Homebrewers do three things very well: brew, drink, and enter brew competitions. Brewers descended upon Backstage in Torrington on August 9 for the second of three rounds of a Backstage/Sierra Nevada Brewing competition. The final round is scheduled for Thursday, Oct. 25, also at Backstage. 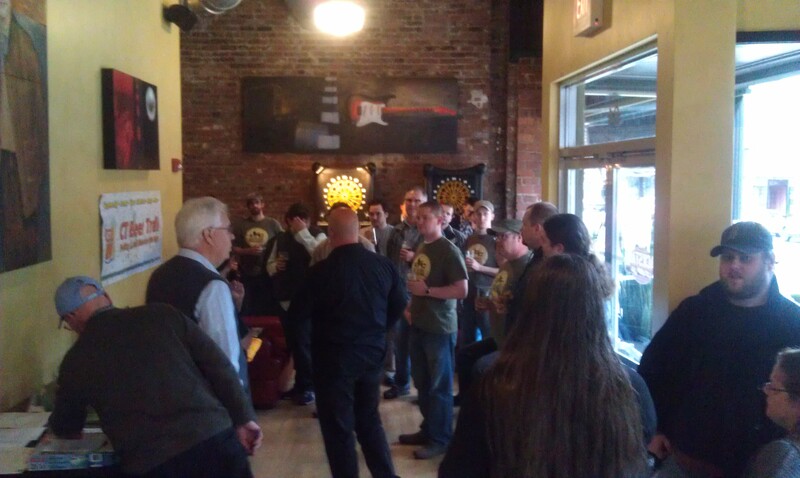 The first round drew 35 entries, and round 2 competitors were made up of nine from the top 12 from round 1 and three from an “open” category, explained Stephen Raimondi, a certified beer judge and one of the judges for the compeititions. Brewers submitted 12-ounce bottles for judgement. The brewer with the highest score of 40 in round 2 was Mike Patient, who brewed a Munich Dunkel. Beers with a score of 25 or above are viewed as being quite good in judging circles, and anything over 30 is pretty unusual for homebrew competitions, using the Beer Judge Certification Program guidelines of a 0-50 grading scale, Raimondi explained. Patient’s beer — along with the Northern English Brown Ale by Jody Rockhill, who recieved a 38.5 — were “exceptional,” Raimondi said. The other brewers who can advance to the next round were Ed Silva, Heath Gelinas (who brewed a peanut butter chocolate stout), Dan Roy, and Ryan Fitzpatrick. Tim Phelps will also advance to round 3 for his entry in the open division. The final round is only open to the winners of round 2. Unlike rounds 1 and 2, it will be limited to fruit or spice/herb/vegetable beer entries. Joining Raimondi at the judges’ table were Jason McClellan of Olde Burnside Brewing in East Hartford; Rich Loomis of Brew and Wine Hobby, also of East Hartford, and brewery-to-be, Firefly Brewing; and Bryon Turner, who runs the website and fiercely pro-Connecticut craft-beer organization, CT Beer Trail. Each competition is paired with a tap-takeover by Sierra Nevada. One of the brewery’s representatives, Marty Juliano, came up with the idea of the combination tap-takeover/homebrew comp with Backstage General Manager Chris Verilli, said Tony Leone. Leone, a homebrewer and fellow blogger, worked with Phelps — president of the homebrew club Krausen Commandos of Northwest Connecticut — to coordinate the competition. Leone said that the beers offered by Sierra Nevada during each competition made the nights particularly special. “The highlight in my book from round 1 was the 2009 Bigfoot Barleywine that Chris put on draft,” Leone said. Read more from Leone at his blog, Beer 411. This entry was posted in Beer Snob and tagged Backstage, Beer 411, competition, CT Beer Trail, Firefly Brewing, homebrewing, Krausen Commandos, Olde Burnside Brewing, Sierra Nevada Brewing, Wine and Hobby. Bookmark the permalink.